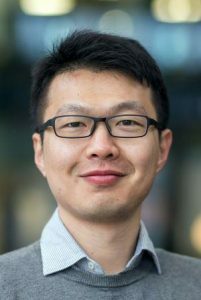 Mengmeng Li obtained his PhD degree under the supervision of Prof. Klaus Müllen at the Max Planck Institute for Polymer Research in Mainz, Germany in 2016, with his research topic of molecular self-assembly in mono- to multilayer organic field-effect transistors. Afterward, he moved to Eindhoven and joined the group of Prof. René Janssen at TU/e as a postdoctoral researcher. Since 2017 he has been awarded Marie Skłodowska-Curie Individual Fellowship from European Commission. His current research interest is Controllable Growth and Charge Carrier Transport of Fibrillar Microstructure of Semiconducting Polymers in Field-Effect Transistors and Photovoltaics.